Rebuilt QCM 83 leads C636 no. 77 and an M636 with empties at the Able road crossing, June 5th, 2000. The engineer's front window is enlarged for better visibility. 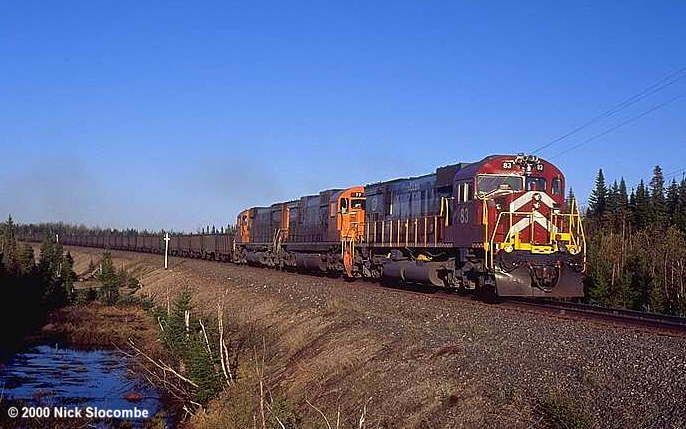 Quebec Cartier Mining still relies partly on it's sizeable MLW and ALCo fleet. 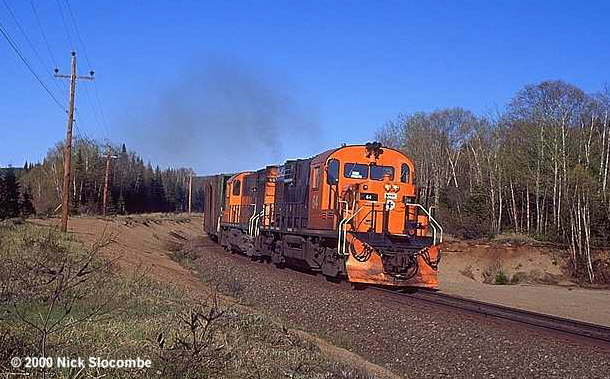 The railway operates ore trains between Mont Wright and Port Cartier (Province Quebec) and log trains. In 1999 there were one C630, three C636, 21 M636 and seven RS18's on the QCM roster. The C-620 #34 only served as a backup unit at Mont Wright and hit the high iron rarely, it's now sold to a US collector. 44 was wrecked September 99 and was retired. The stripped locomotive is still at Port Cartier. All three ALCo C636 were active in early June 2000. 83 and 84 were rebuilt to the design shown below. 86 is currently under progress (June 2000). 85 and 87 should follow next, they're out of service at the moment. Mel Wilson reports (6/28/00): 12 new GE AC44CW are expected to arrive in spring 2002! They will have standard control stands, (not desk top), air conditioning, and the generation 2 steerable trucks. They are at this time planning on 2 units on the ore trains. 12 MLWs are to remain after that. Now that the GEs are on the property MLWs are only trailing units. The RS18 will be retired upon delivery of the GE and will be either sold or scrapped. The remaining 12 (rebuilt) MLWs will replace the RS18s in their duties. Eight units (41, 43, 45, 47, 75, 77, 78, & 85) were sold to the US in late 2002 and are planned to be offered as lease units after they have been upgraded to FRA standards. As of November 2002 they were reported to be stored in upstate New York. I found them in excellent external condition at Cohocton's Bath & Hammondsport shops in later September 2003. The B&H is a division of the Livonia, Avon & Lakeville Railroad. 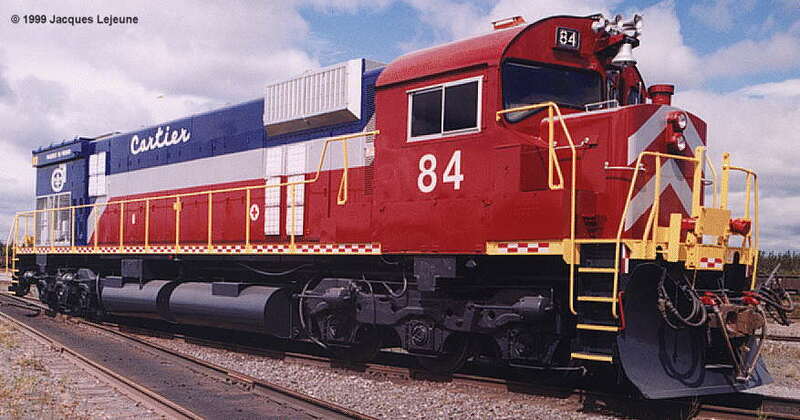 QCM M-636 in the new company colors. Normand Paradis of QCM is responsible for the design which was chosen from a dozen designs. He thankfully submitted the photo. The cab was redesigned, too. About two or three units per year will receive this design during the scheduled overhauls.